3201 W White Oaks Dr. Learn what health care tax deductions are available to you for assisted living, memory care, respite stays or adult day care. 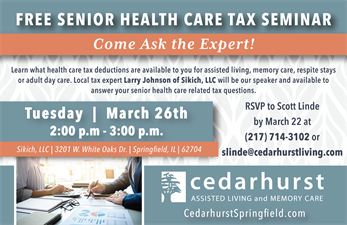 Local tax expert Larry Johnson of Sikich, LLC will be our speaker and available to answer your senior health care related tax questions.